I wanted to share a few photos from our weekend in Quebec city. Chateau Frontenac, which is now a hotel. I'm sure it would be a cool place to stay at, but maybe another time. It does look impressive though. Quebec City is a walled city, so you could see (obviously) walls, towers, cannons and other defence structures all over the place. And, naturally, I was true to myself and basically kept taking a ton of photos of buildings. There were a lot of very quaint little streets and cute shop fronts. And, the history nerd that I am, I chose one museum we would go to on Sunday before driving home. I picked the museum of civilization and found their samurai exhibit fascinating. I'm not sure if I've mentioned before, but I love, love, looove historical novels and read a lot. Basically anything I can get my hands on... One of my all time favourites is set in feudal Japan in the 1600s, so needless to say I loved every tiny bit of this exhibit. The others were fine, nothing too spectacular, but this alone was worth it for me. I also tracked our walk on Saturday, this is the route we walked that day. I did forget to turn it on for a few bits, but it gives you an idea. Great, so you finally found an app to track your route. What do you use? Historical novels... Have you read Hilary Mantel's Wolf Hall and Bringing Up the Bodies? I just finished those, about Henry XIV. But as you know, I'm a long term childhood musketeer-fan. Also a historical novel of sorts. Yeah, finally got a good one! I'm using runkeeper. 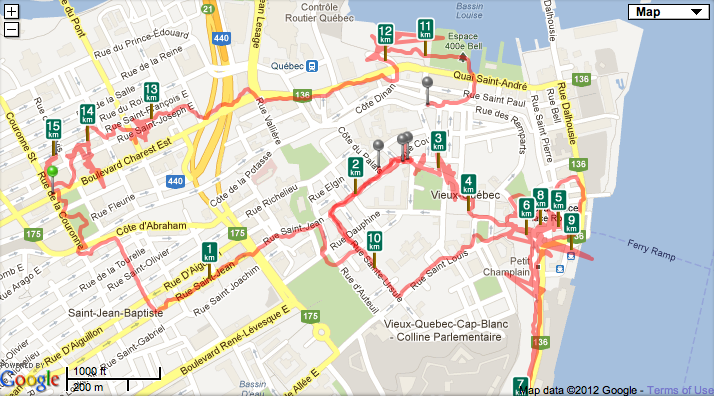 It's awesome because it also tracks elevation, I wouldn't care on regular use, but Quebec City is pretty hill-y. I haven't read those... I'll definitely look into it, I'm running low on books to read again. Thanks for the recommendation!